Our objective: To visit PFC Derek McConnell. Derek is a buddy of Chris's who was severely wounded by an IED in Afghanistan, in July. 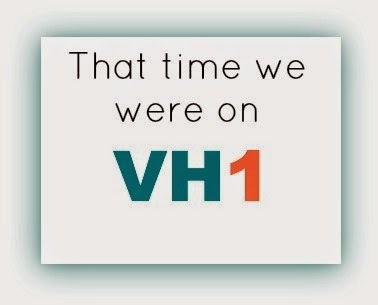 I will never forget the phone call. The blast happened close to Chris. Derek means a lot to Chris. The day after that explosion, when I sat in my office, on the phone with my little brother, I could hear how freaked out he was in his voice. He sounded sad. And terrified. And that was the first time I ever heard it in his voice. It probably wasn't the first time he felt that way, but it was the first time I could tell. I hung up the phone, and started crying, right there in the newsroom. A couple of days later, I found this Facebook page, Prayers for Derek McConnell. And I started praying for this guy, every day. Then, I found his mother, Siobhan's blog on Caring Bridge. She shares a daily journal of how Derek is doing, life at the hospital with her one-day-to-be daughter-in-law/Derek's incredibly cute and full of love girlfriend, Krystina. I never miss a day of reading it. I have prayed so much for this family, emailed back and forth with them, and read every single update, I felt like I already knew them. I recognized them in the hallway when we got there. Chris walked into Derek's room first. The rest of us wanted to respect Derek and his family's wishes, and just be there for support. We didn't want to crowd up the room, but we were invited in. "Sgt. Brown," I heard Derek say. And I watched my little brother, who I know is generally incredibly uncomfortable in hospital situations not be a guy who is freaked out by a bunch of medical stuff, but as a SGT leading a PFC. "McConnell," Chris said, as he went in. We greeted Derek's mom and girlfriend in the hallway for a bit while he and Chris visited. Siobhan gave me permission to take a few pictures. It was hard for me to get Derek's face in the picture because I'm so short, and I couldn't see over the foam supporting his arm. (He had just had surgery on it the day before) Derek's girlfriend, Krystina, is a major Steelers fan, so I joked that it looked like Derek had a Packers Cheesehead in a head lock! 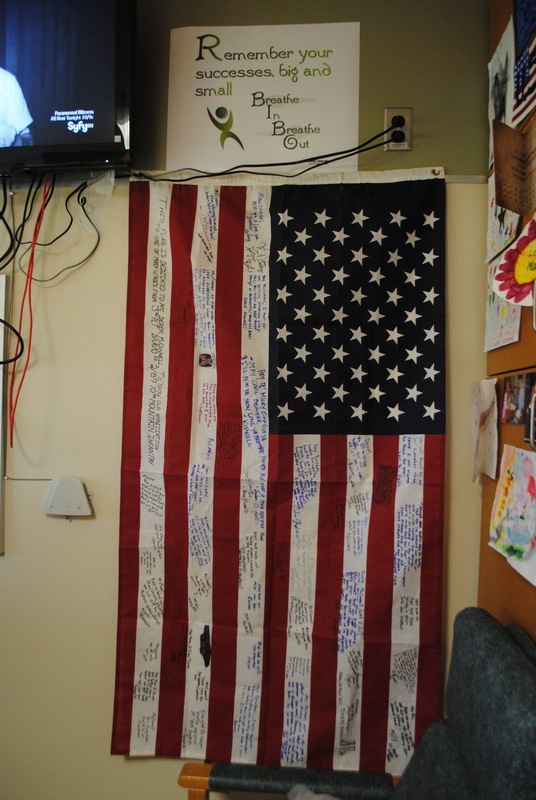 Chris brought Derek a flag from Afghanistan that all of the guys, except the ones who were on leave at the time (and they visited Derek when they were home, too) signed, in dedication to him. 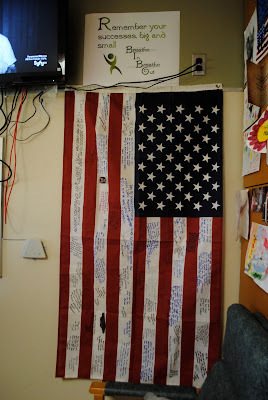 Derek was asking about where particular soldiers signed it, and Chris pointed that out, as Derek's mom hung the flag up in his hospital room. 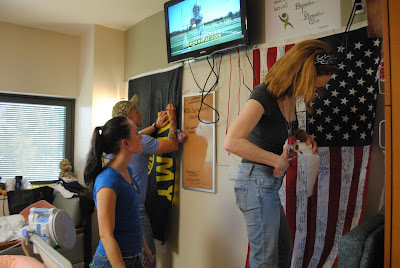 Chris signed another Army flag that hangs for visitors to sign. 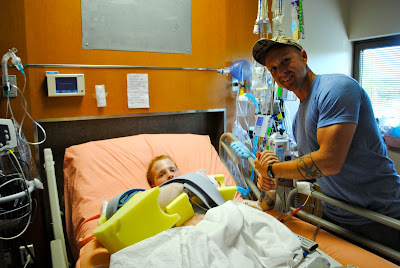 I was struck by so much in that small hospital room that day. Struck by the power of love. The love of a mother to write every single thing down in a notebook, to follow doctors' and nurses' actions so attentively because she wants her son to get 100% the best care possible. Struck by the love of a girlfriend who dropped out of school and quit her job to stand by her soldier through this trial. These two women are so strong and amazing. They haven't been home to New Jersey since July. They love Derek with all they are, and they love each other, and being around that kind of love is just flat out inspirational. I said it. And I wouldn't mess with either one of them, either! :) They're small, but they are feisty! Chris also gave Derek his camo Army ball cap. The other thing I was struck by in that hospital room was the sacrifice. Here was a 21 year old guy, with no legs. The bottom of the bed - empty. The sacrifice he has made was profoundly obvious. Then, I thought about the sacrifices his girlfriend has made, putting off school and work. And his mom, a single mother of 5 kids, here for months. His brothers and sister are sacrificing. 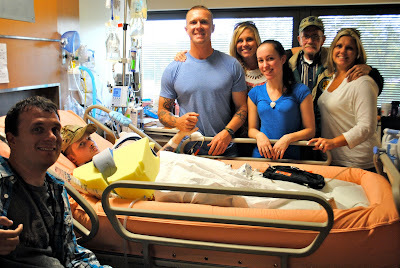 His unit, still fighting in Afghanistan, is sacrificing without him there to fight with them. The doctors and nurses... the list of sacrifice goes on and on and on. And Derek is not the only guy in this position. 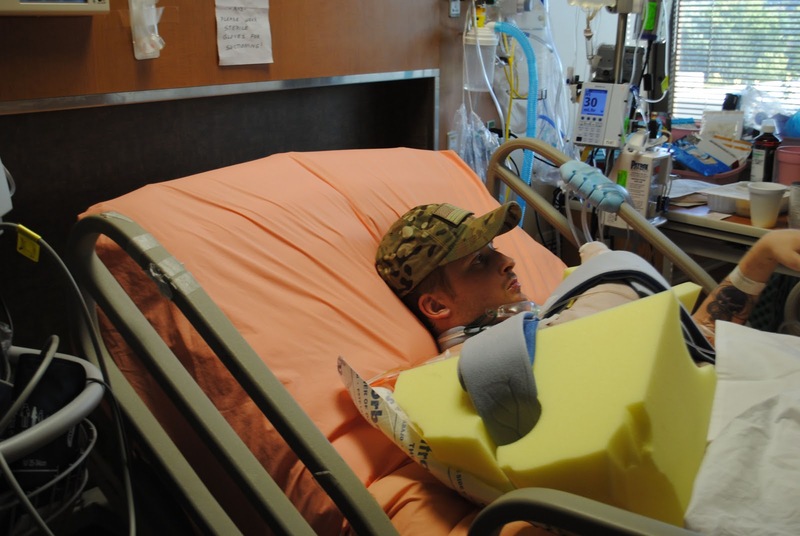 Walter Reed is filled with American soldiers who are making life altering sacrifices. I was moved by seeing this in person, with my own eyes. You don't see these stories on the news as often as you should. I think the print media has done a better job than TV. The Huffington Post and the Washington Post have done stories. And, recently Scott Pelley of CBS News spent a week filing stories with my brother's unit in Afghanistan. But this kind of love, this kind of sacrifice, it's a story. And I am profoundly grateful. I have to do something. For this family, it will be meals. Let me know if you want to help with that! But there is something stirring in my heart. Especially for these young couples, like Derek and Krystina, and Rebecca and Dan who Michael wrote about yesterday. 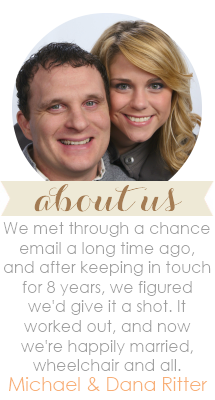 I'm wondering if there is anything Michael and I can do to help these young couples new to disability. I know it's not the same. But, I just wonder if this is a place God would want to use us. We are available, Lord. wonderful. i think about their sacrifices often. beautifully written. they are in my prayers. Every now and then you write a post that simultaneously makes me cry and makes me wonder how you can consistently maintain such an attitude of strength and beauty. Once again, I'm honored to be your friend. I can't imagine being strong and courageous enough to make these sacrifices so graciously as these families seem to be doing. I pray for all of our over sees soldiers to be safe and guarded by God as they defend the wonderful nation we live in, and I pray that our government keeps them comfortable and compensated when they come home. God bless our soldiers. Wow! I found the link to your blog on Siobhan's FB page. I, too, have followed her Caring Bridge journal since the beginning and feel I know them even though we are complete strangers. They are all an inspiration to us! What an honor that you got to meet them in person.